What do expansion peripherals do, and how is integrating them helpful? Expansion peripherals have two purposes: to expand the capabilities of the data logger, both in channel count and functionality, and to improve measurement quality. What if we could provide both and make it easier to set up your system? And, what if by doing this, we decreased the overall cost of your monitoring system? And, your cost savings grew when you consider that you can now use a smaller enclosure? In this article, I’ll introduce you to some key benefits of the feature-integrated CR1000X Measurement and Control Datalogger that I think you’ll appreciate. With our previous data loggers, such as the CR1000, you needed to purchase additional peripheral devices and connect them to the data logger to increase its measurement, control, or communications capabilities. With the new CR1000X, several of these capabilities are integrated into the data logger so that you may not need the additional peripheral add-ons. The CR1000X has three integrated peripherals that I think you will find both helpful and cost-saving to your system. To better illustrate how these peripherals work with a data logger, I will refer to the CR1000X’s predecessor, the CR1000, but this information is also true for our CR800, CR850, and CR3000 dataloggers. 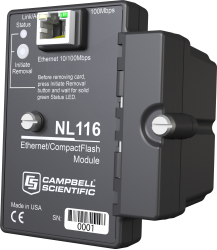 The NL116 Ethernet Interface and CompactFlash Module was created to expand the CR1000’s capability. The NL116 provides a 10/100 Mbps RJ-45 connector for native Ethernet connection to the CR1000, allowing it to communicate directly using a variety of Internet protocols. This same native Ethernet connection is now available directly on the CR1000X through its integrated RJ-45 10/100 Mbps port. The NL116 also provides expanded data storage capacity. Using the NL116’s CompactFlash card slot, a Type I or Type II card can increase the data storage capabilities of the CR1000 up to an additional 16 GB. For the CR1000X, your data storage expansion is provided by an integrated microSD card slot. A microSD memory card can increase the memory capability of the CR1000X by an additional 8 GB. This might not sound like an advantage, but keep in mind that the overall internal data storage capability of the CR1000X (4 MB SRAM + 72 MB flash) is much greater than the CR1000 (4 MB SRAM). The SDM-SIO1A 1-Channel Serial I/O Module provides the interface connection between the CR1000 and serial devices (such as intelligent sensors, actuators, or displays) using RS-232, RS-485, or RS-422 signal levels. For the CR1000X, serial communications are provided by the dedicated RJ-45 port that can operate as either an RS-232 or CPI port. The CR1000X also has removable connectors and eight terminals that you can configure for digital communications including UART, RS-232, RS-485, and SDI-12. Many other functions are also possible, such as communicating with all our Synchronous Devices for Measurement (SDMs). 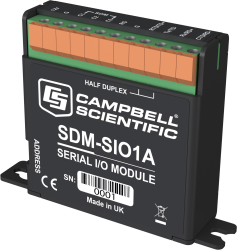 A few years ago, Campbell Scientific introduced a line of peripheral devices called CDMs (Campbell Distributed Modules). These modules increase the channel count of data loggers, add data logger functionality, and improve measurement quality—all while allowing a network of modules to behave as a single data logger. For our data loggers that were introduced prior to the development of these CDMs, an interface was required between the CDMs and the data logger: the SC-CPI Datalogger-to-CPI Interface. 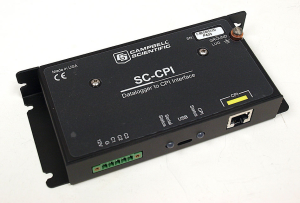 The SC-CPI interface is required when using the CR1000 with any of the CDMs. 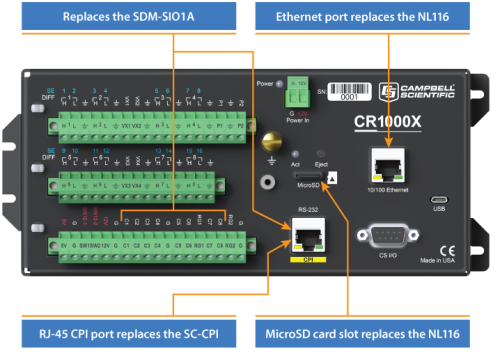 With the CR1000X, you can connect your CDMs directly with the RJ-45 port—without the need for an SC-CPI interface. To buy the CR1000 with the required peripherals would cost hundreds of US dollars (USD) more than purchasing the CR1000X datalogger. While it is true that most applications do not require all these devices, if your application requires just one of them (the NL116, SDM-SIOA, or SC-CPI), you would still save money by buying the CR1000X. Obviously, if you can buy a single data logger with integrated peripherals instead of a data logger with multiple other devices, you need less space for your components. This means, for example, that you can use a smaller enclosure, which may be advantageous at sites with space restrictions. In addition, being able to use a smaller enclosure saves you money. Many configuration settings that are required with an external peripheral device—to allow it to communicate correctly with the data logger—are eliminated with an integrated system. Simply stated, an integrated system is easier for you to set up. Another benefit of a data logger with integrated peripherals is that you don’t need to individually wire these devices to your data logger, which saves you time. All our Campbell Scientific products are manufactured with the same attention to detail and quality. Whether you choose a data logger such as the CR1000 with additional peripheral devices, or a CR1000X with integrated peripherals, you are guaranteed products that have been designed and manufactured to stand up against the most extreme environmental conditions on earth, in addition to consistently providing reliable and accurate data. Individual testing of each data logger through the entire operating temperature range ensures that the CR1000X will perform at the specified accuracy levels. The results of these tests are found on the data logger’s calibration certificate. When purchasing the CR1000, you can select an option to have a calibration certificate shipped to you with the data logger, which incurs an additional cost. When purchasing the CR1000X, the calibration certificate is included (at no additional cost). Other Campbell Scientific offices may provide the calibration certificates via a different method. Contact your supporting office to learn how your certificate will be delivered. After reading this article, I hope you’ve come to appreciate the ease of operation and cost-saving benefit of the CR1000X with its integrated peripherals. When we designed the CR1000X, we tried to include features that would make it easier for you to use while maintaining the high level of quality you’ve come to expect from our measurement and monitoring products. If you have any questions about the CR1000X, please post them below.